You have Pinterest recipes, bookmarked recipes, saved-off-Instagram recipes, recipes scribbled onto index cards, recipes friends emailed you, recipes torn out of magazines and favorites from cookbooks…it’s hard to keep track of it all, and OrganizEat understands that. This clever app provides an opportunity to digitize all of your favorite recipes in an easy and organized fashion. OrganizEat allows you to import all of your recipes into easy-to-access folders. The app automatically syncs with many well-known cooking websites and blogs, so you can save your favorite dishes straight from your browser. 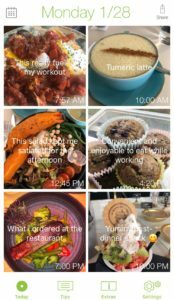 OrganizEat can also save recipes from websites it does not recognize – as well as handwritten recipes – in the form of screenshots. After you download recipes to OrganizEat, you can customize your recipes by adding notes and adjusting ingredient lists. The check mark in the upper right hand corner allows you to “set aside” recipes you would like to make in the coming week, and the meal plan calendar feature is helpful for planning which recipes to make when. The full version of this app – which allows for unlimited syncing of recipes, recipe backup and account sharing – costs $5.99/year or $24.99/lifetime. You are bound to enjoy the serenity that tidying brings while transfering your recipes to OrganizEat. Have you ever been in the middle of baking and realized that you were missing the next ingredient? Using Anylist is a good way to make sure that won’t happen again. Like OrganizEat, Anylist allows users to import and organize recipes from the web. Once your recipes are synced, you can select items from ingredient lists that you need to purchase and add them to grocery lists, which can be shared, emailed and printed. 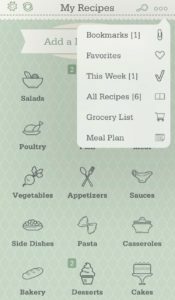 If you upgrade to the full version of this app (yearly rate: $7.99/individual and $11.99/family), you can access the meal planning calendar and other features, though the list feature is reason enough to download Anylist. Have you ever not known what you were in the mood to eat? Mealime helps you navigate the kitchen on days when you’re feeling lost. After asking you some questions about your dietary preferences and restrictions, Mealime will generate several recipe suggestions for you. The recipes, which all come with aesthetically-pleasing pictures, specify the cookware, ingredients and amount of time they take to cook. You can add any recipes you like to a weekly meal plan, and, after you have completed your recipes, their corresponding photos will turn gray, which helps you keep track of your cooking. 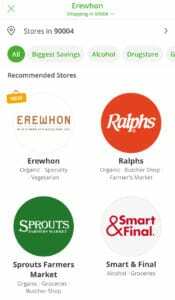 The meal suggestions that this app provides are generally best suited for dinner or lunch. If you upgrade to Mealime pro ($5.99/month or $49.99/year), you can access exclusive recipes, nutritional information for the recipes and upload your own recipes to the app, among other features. If you are always wondering what your friends are eating for dinner, then Prepear is the app for you. In addition to providing a platform for uploading and organizing recipes like OrganizEat and Anylist do, Prepear’s “Food Feed” allows you to see what your friends have “Prepear’d” recently – and their weekly meal plans. 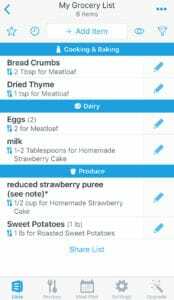 There is also a grocery list feature on this app, which will add all of the ingredients in the recipes you flag to a list. You can add all of the items that you have at home to your “Pantry” list so that the app won’t add them to your grocery list. Upgrading to the gold version of Prepear ($9.99/month or $99.99/year) will allow you to save and re-use meal plans and access recipe reminders, among other benefits. See How You Eat – abbreviated SHYE – provides a means to visualize the progress you’re making toward reaching your nutritional goals. When you download the app, SHYE will ask you to type in a goal and indicate secondary benefits that you may experience as a result striving to reach that goal. SHYE dismisses dieting and restriction and instead encourages users to foster well-being by eating balanced meals 80 percent of the time. The app, which is set up like a picture mosaic, allows you to upload pictures of your meals and snacks. There’s space to write in the time you ate as well as notes relating to your eating experience. This is an especially good feature for those working on mindful eating or for those trying to identify foods that cause gastrointestinal discomfort. Additionally, SHYE provides you with a daily motivational tip and allows you to share your notes and images. 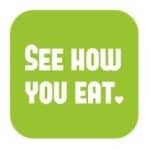 This is convenient if you’re working with a dietitian who can use the visual reference to review your dietary choices. SHYE will check in with you about your progress daily, and there’s an option to set reminders for when to eat meals and snacks. 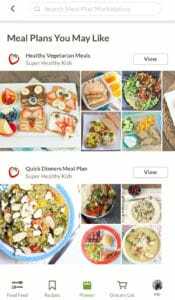 I hope that these app suggestions will not only help you make peace with your plate, but also with the process behind creating that plate. 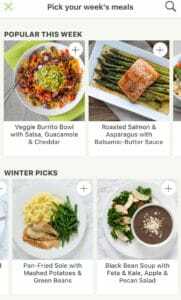 If you found this article helpful or have suggestions for other meal planning apps, please leave a comment below. ‘Appy meal planning! 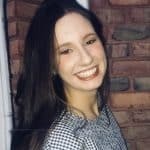 I’ve had great experience with CopyMeThat – it allows me to upload recipes from websites or enter them manually, create my meal plan, and create a shopping list. It works well on my computer and as an app on my phone, and it’s free! Just thought I’d share that recommendation, as it’s made meal planning very easy for me.